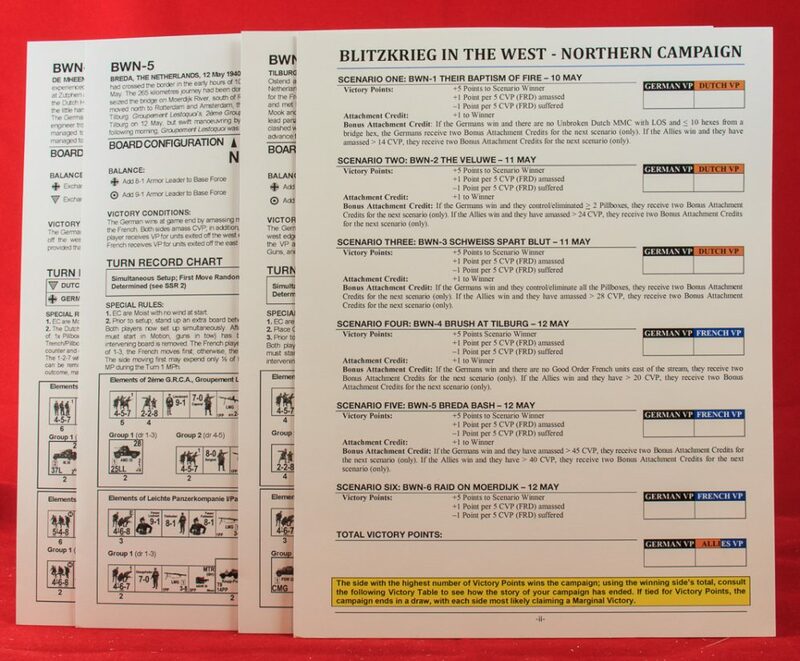 Blitzkrieg in the West: Northern Campaign (hereinafter Northern Campaign) is a small scenario pack whose six scenarios can be played in succession, with some additional rules, as a linked-scenario campaign game. The “northern campaign” in question is not, as many might suppose, the German invasion of Norway in 1940, but rather the German invasion of the Netherlands in May 1940. The six scenarios feature the Germans pitted against Dutch, French, or Dutch/French troops. To play the campaign game, players play each of the six scenarios in specified order. The winner of each of the first five receives “Attachment Credits” that can be applied during the next scenario. At the end of all the scenarios, VP points are totaled and a winner determined. Attachment Credits do not allow players to purchase additional forces but instead can be used to influence the die roll that players make in every scenario for what are called “variable attachments.” What this means is that OBs in each scenario are partially random and if you win the previous scenario you may be able to get a wee bit more control over what you get in the present one. It is a modest award for winning, but that is probably the best for balance reasons–if the better player wins a scenario and can thus significantly improve his forces for the next scenario, he will have an even greater chance of winning that one, and so on, with the less-skilled player really feeling as if he were in an increasingly hopeless position. However, Northern Campaign undercuts its own strategy to a certain degree by also awarding what it calls “Bonus Attachment Credits” if one side wins by a large margin. So, for example, the winner of the first scenario, BWN1 (Their Baptism of Fire), gets one attachment credit. So far so good. however, if the German player wins and another conditions is reached, or if the Dutch win and a certain condition is also met, they get two Bonus Attachment credits on top of the one they already get for winning. This will give a much better player more ways to get a better OB in the next scenario. The loser will simply have to be lucky. For each scenario, the winner gets 5 campaign VP. Each side also gets a VP for every 5 CVP inflicted and loses one for every 5 CVP suffered. So if one side wins a scenario but loses a lot of casualties to do so, it may be a sort of Pyrrhic victory. 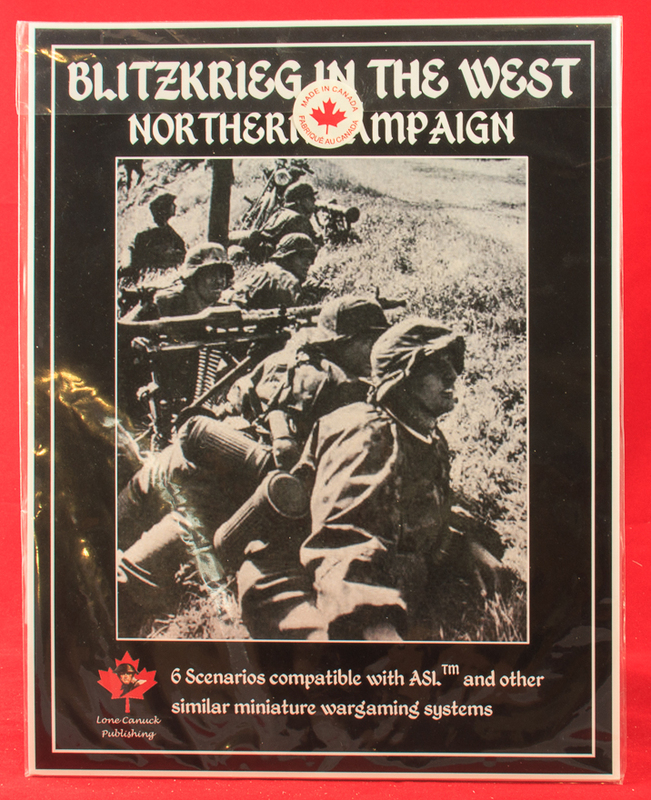 Northern Campaign comes with a small number of counters; this is a recent feature of some Lone Canuck products and one to be encouraged. There are 14 counters and they come separated, which usually suggests either handmade counters or counters separated by laser-cutter. I tend to think perhaps laser-cutter but can’t be sure. the art on the counter are okay, though to the naked eye it seems very slightly pixilated, and it is also a bit small, with generous margins on the sides, perhaps to protect counter information from being cut off. Even so, many of the counters are off center towards the top. Still, they are serviceable and will not embarrass your other counters by being beside them. The counters include 4 duplicates of existing counters (Pz IIAs) and three types of new counter, two German and one Dutch. The first new German unit, of which there are two, is the PzBfWg IB, which is simply a command tank with nothing but a single BMG. The second one is the Kfz 69/70 and is nothing but a truck; there are 6 provided. The Dutch counter is the 57mm Infantry Gun (6-veld), described as the “standard Dutch infantry gun.” It is not a bad little gun, in the game, at least; 2 are provided. To play all six scenarios (and, thus, also the campaign game), one needs the following boards: 2, 5, 6, 17, 38, 40, 43, 44, 57, 59, 66, 3b, and ASLSK boards q, u, and x. One scenario is (barely) large in size, another is medium-sized, the rest are small. Two scenarios have OBA; one of those also uses Air Support. No scenarios are Night scenarios. Lone Canuck scenarios usually suffer by having way too many SW; these scenarios are no exception; the OBAs all come loaded for bear, unfortunately. The scenarios tend to be vehicle-heavy and the ones that are infantry-only tend to have OBA or considerable fortifications or both, so the pack is not necessarily that well-suited to beginners, despite its reliance on Starter Kit boards. In general, players of this pack should be familiar with motorcycles, cavalry, trucks, towing, wire, pillboxes, platoon movement, trenches, flamethrowers and DCs, in addition to OBA and Air Support. All of the scenarios have partially-random OBs for both sides. Partially-random OBs offer variety and replayability but come with two drawbacks: 1) they are notoriously more difficult to playtest, particularly if both sides have them, so unless this pack was very well-playtested, balance may possibly be an issue at times; and 2) with small scenarios, like the several such in this pack, they can instill a certain gameyness into the scenarios, in the sense that the random OB roll might possibly be the most important roll of the game. Players just need to approach such scenarios being aware of these limitations (and should probably avoid them in tournament play). Two of the scenarios, BWN4 (Brush at Tilburg) and BWN5 (Breda Bash) not only have random OBs but also have simultaneous hidden set-up (using a vertical board to block view of the other player’s part of the playing area) and randomly determine which side moves first. Both of these measures are somewhat polarizing, with each having their admirers and detractors. 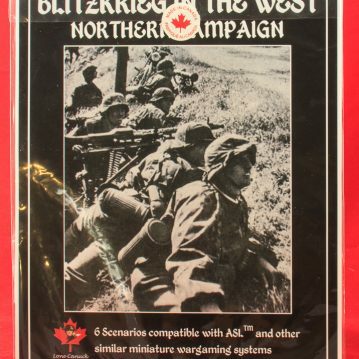 This pack will appeal most to fans of early war scenarios, fans of exotic scenarios (for the Dutch), and people who might enjoy a linked-scenario campaign game, each scenario of which can be played in an afternoon or evening (i.e., a very manageable campaign experience).